All the comprehension quizzes combined into one package. 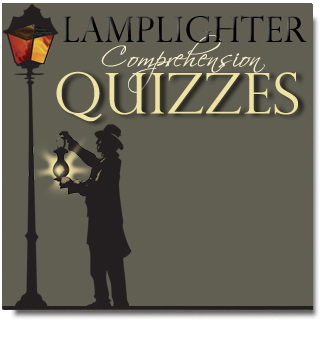 All quizzes are 10 questions long, testing on the content and morals behind each Lamplighter story. A ten multiple-choice question reading comprehension set about "The Battle"
A ten multiple-choice question reading comprehension set about "The Bird's Nest"
A ten multiple-choice question reading comprehension set about "The Boy of Mount Rhigi." A ten multiple-choice question reading comprehension set about "Boys of Grit who Became Men of Honor"
A ten multiple-choice question reading comprehension set about "Boys of Grit who Changed the World." A ten multiple-choice question reading comprehension set about "Boys of Grit who Never Gave Up"
A ten multiple-choice question reading comprehension set about "Buried in the Snow"
A ten multiple-choice question reading comprehension set about "The Captive." A ten multiple-choice question reading comprehension set about "Charlie's Choice." A ten multiple-choice question reading comprehension set about "The Children of Cloverley." A ten multiple-choice question reading comprehension set about "Christie, the King's Servant." A ten multiple-choice question reading comprehension set about "Christie's Old Organ." Comprehension Quiz: Clean Your Boots, Sir? A ten multiple-choice question reading comprehension set about "Clean Your Boots, Sir?" A ten multiple-choice question reading comprehension set about "Cobwebs and Cables." A ten multiple-choice question reading comprehension set about "The Courage of Nikolai." A ten multiple-choice question reading comprehension set about "The Crew of the Dolphin." A ten multiple-choice question reading comprehension set about "The Cross Triumphant." A ten multiple-choice question reading comprehension set about "Daring Deeds." A ten multiple-choice question reading comprehension set about "Enoch Roden's Training." A ten multiple-choice question reading comprehension set about "Exiles in Babylon." A ten multiple-choice question reading comprehension set about "Faithful but not Famous." A ten multiple-choice question reading comprehension set about "Fire in the Sky." A ten multiple-choice question reading comprehension set about "Fireside Readings (Vol 1)." A ten multiple-choice question reading comprehension set about "The Giant Killer"
A ten multiple-choice question reading comprehension set about "The Golden Thread"
A ten multiple-choice question reading comprehension set about "The Hedge of Thorns"
A ten multiple-choice question reading comprehension set about "Helen's Temper and its Consequence"
A ten multiple-choice question reading comprehension set about "The Hidden Hand"
A ten multiple-choice question reading comprehension set about "The Highland Chairman"
A ten multiple-choice question reading comprehension set about "The House of Love"
A ten multiple-choice question reading comprehension set about "The Inheritance"
A ten multiple-choice question reading comprehension set about "Ishmael"
A ten multiple-choice question reading comprehension set about "Jessica's First Prayer"
A ten multiple-choice question reading comprehension set about "Jill's Red Bag"
A ten multiple-choice question reading comprehension set about "Joel: the Boy of Galilee"
A ten multiple-choice question reading comprehension set about "John Ploughman's Talk"
A ten multiple-choice question reading comprehension set about "Karl Jansen's Find"
A ten multiple-choice question reading comprehension set about "The Lamplighter"
A ten multiple-choice question reading comprehension set about "Little King Davie"
A ten multiple-choice question reading comprehension set about "The Little Lamb"
A ten multiple-choice question reading comprehension set about "Little Sir Galahad"